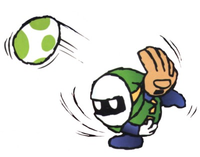 Green Gloves are green Bandits that hold baseball gloves in the games Super Mario World 2: Yoshi's Island, Yoshi's Island: Super Mario Advance 3 and Yoshi's Island DS. Green Gloves are the catchers in the Baseball Boys, and use teamwork with their yellow-colored counterparts, Sluggers. If Yoshi throws an egg toward one, they will catch the egg, aim at Yoshi, and throw it back at a high speed. If Yoshi is hit, it can knock him off a platform and into a bottomless pit or spikes. Ground Pounding their heads or stepping on them repeatedly will defeat them. However, they are immune to a Yoshi's tongue, so eating them is impossible. They can also be used to reach items like Flowers that are out of reach by ricocheting an egg off a wall. In the Yoshi's Island DS Island Museum, there are five Green Gloves and two Egg-Plants. In Super Smash Bros. Ultimate, a Green Glove and a Slugger appear on a Spirit. 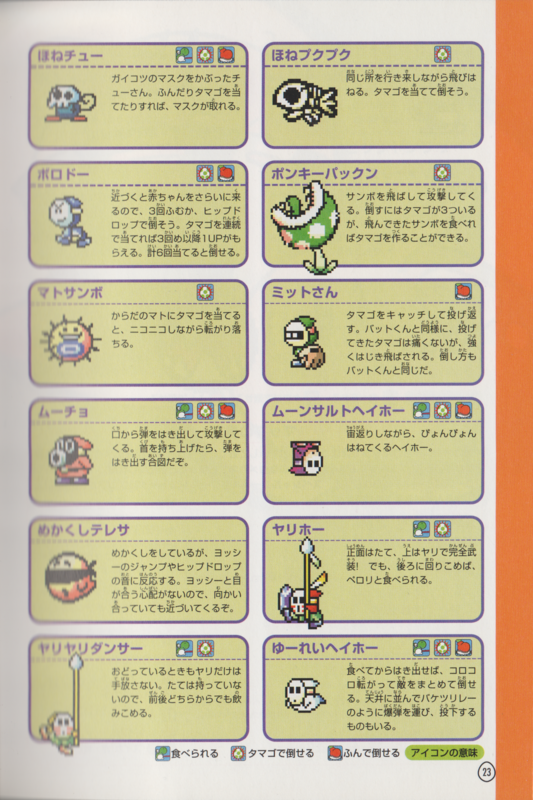 ↑ 「スーパーマリオアドバンス3任天堂公式ガイドブック」 (Super Mario Advance 3 Nintendo Kōshiki Guidebook), page 23. ↑ 杯具中的菜鸟 (December 6, 2014). GBA耀西岛（2-2 捕手小子和击球小子）. Tudou. Retrieved February 3, 2017. This page was last edited on April 21, 2019, at 19:26.